Like much of the UK, Kent’s brewing scene is incredible at the moment. With a constant increase in craft breweries opening across “the garden of England”, one that’s particularly exciting is Time & Tide, operating from a farm near Deal. Set up at the end of 2013 with a mission to deliver “incredible flavours that excite your palate and make you smile”, taking inspiration from just about everywhere (with particular focus on the world of food) the brewery’s core selection ranges from classic brews through to the genuinely bizarre. 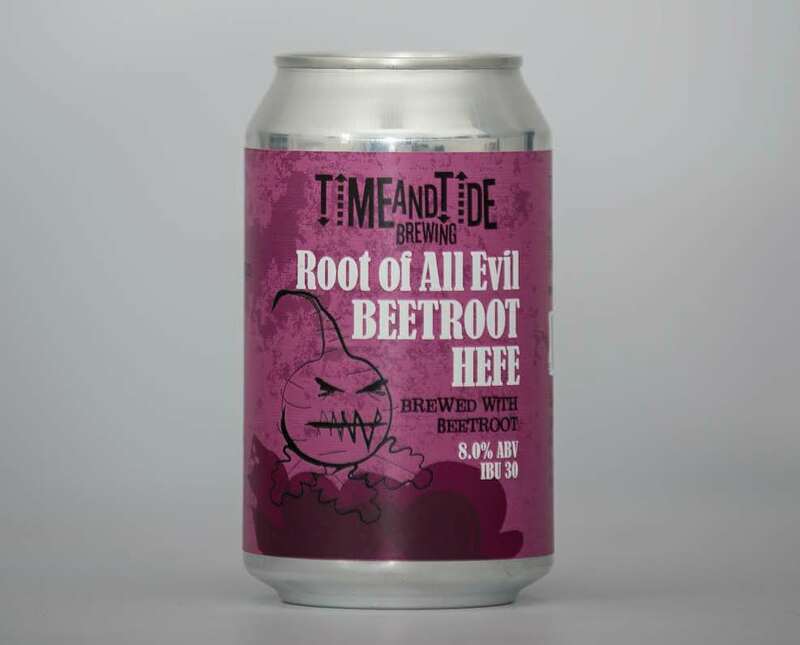 Time & Tide’s ‘Root of All Evil’ Beetroot Hefe, for instance, falls firmly into the latter category. A unique take on German wheat beer, brewed with cooked beetroots that lend a lurid pink complexion as well as plenty of sweetness to the beer. This pink body, when poured from a can, is topped with a vivacious head and is yeast turbid, due to the use of Hefeweizen in the brewing process. On the nose, obvious aromas of beetroot are joined by some subtle spice notes (paprika, turmeric and pepper) and slight grapefruit aromas from the American Cascade hops used. There’s also plenty of sweetness, given off from the complex malt character, that continues on to the palate. Elsewhere, further notes of earthy beetroot are joined by prominent notes of wheat, some more spice, and a very slight hop bitterness that joins a long, sweet and slightly oily finish. What’s most surprising, however, is the low alcoholic potency, especially given the beer’s high ABV. Instead, ‘Root of All Evil’ is very easy drinking, and works as a well-executed contemporary crossover between classic food and beer flavours. Further information on Time & Tide can be found at timeandtidebrewing.co.uk.